Der AMX 65 t ist ein französicher schwerer Panzer der Stufe 8. Dieser Entwurf für einen schweren Panzer wurde 1950 von AMX vorgeschlagen. Parallel zum AMX 50 100 entwickelt, sollte er eine verstärkte Panzerung mit einer „Hechtnase“ und geneigten Panzerplatten bekommen. Andere Komponenten und die Wannenkonfiguration erinnerten an den Königstiger. Von diesem Fahrzeug existieren nur Konstruktionszeichnungen. Der AMX 65 t führt zum AMX M4 mle. 51. At the very first glance, one might get the impression that this vehicle is the very definition of omnipotence: capable main gun, bouncy pike nose, rounded turret and on top of these, very high power-to-weight ratio. However, most players have also familiarized themselves with the AMX 50 120 and the Fochs: rather thin and poorly angled pike nose, weak cupolas and bad terrain resistance. Unfortunately, these are the very same hindrances AMX 65t shared with its cousins. With its giant hull front only 10mm thicker than the AMX 50 120, AMX 65t will struggle to block shots coming from even certain low tier vehicles. This major weakness relegates the tank to a second-line supporter/flanker role. 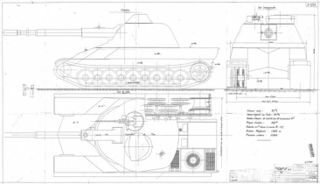 There it could work like an hybrid between the IS-3 and the T34, combining hull-down ability with some mobility, though mastering in none. The 100mm SA47 gun will be available if one have researched through the auto-loading heavy branch or the medium branches. Mount it immediatly. Otherwise, only the HL 295 engine and the radio are carried over from the prior vehicle. Mount these to ease the priority-one grind for the 100mm SA47 gun, unless you're desperately short on funds. If you find the 100mm gun coupled with stock turret still acceptable, grind for the top engine and then tracks: the improved fuel-injecting model of HL 295 will provide a major boost on mobility, and continues to serve the next vehicle, AMX M4 mle. 51. If you prefer to have more firepower at disposal, research the tracks for necessary weight capacity then the turret and optionally the 120mm D.1203 gun. Alternatively, one may substitute the tracks with Enhanced Torsion Bars equipment. Just be noticed that the D.1203 gun is not required to move on to the next vehicle, and will not unlock for free upon researching the AMX M4 mle. 51. Finish any remaining modules and go from there. Since this vehicle has only mediocre damage-per-minute on 120mm gun and low alpha damage on 90mm and 100mm guns, a Gun Rammer is almost mandatory. The rather lousy gun dispersion values on movement and traverse can be greatly compensated by installing a Vertical Stabilizer, but the Gun Laying Drive is not that useful unless one sticks with the 100mm SA47 gun. The third slot depends mostly on one's playstyle: If not occupied by Enhanced Torsion Bars, it could be Ventilation to further improve overall parameters, or Coated Optics to make up for subpar view range. Toolbox also worths consideration if one gets entangled in crossfire from time to time. The AMX 65T is one of the many proposals for a tank destroyer version of the AMX M4, developed in 1950 alongside the oscillating turret. The tank destroyer would have had a "chevron type" upper front plate with a pike nose, a cast turret, and a 100mm gun. The final variant selected for the project would have had 45mm of frontal armor and weighed 51.2 tons, but heavier variants with thicker armor - like the AMX 65t - also were considered. Ultimately, none of these tank destroyers were ever built, though separate elements - such as the pike nose - were later built in metal. 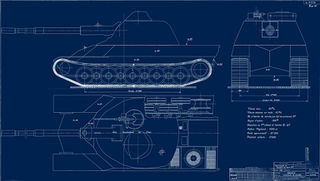 Technical drawing of the AMX 65T. 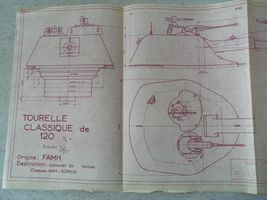 The FAMH turret used by the AMX 65T. Another proposal for the AMX M4-based tank destroyer. This one weighed 51.2 tons. * The AMX 65T was intended to be a tank destroyer, though the designation was arbitrary - the ARL 44 was reclassified as a tank destroyer during the AMX 65T's development. The 120mm gun nor the 90mm gun were ever proposed for the AMX 65T. Diese Seite wurde zuletzt am 11. Februar 2018 um 18:28 Uhr geändert.